Extensions are X and Pro specific plugins available for download for all customers with a validated purchase of X or Pro. You can easily download and manage all of your Extensions directly from the WordPress admin area under X > Validation or Pro > Validation. This article covers documentation for the Google Analytics Extension and goes into detail on certain features where needed. After installing and activate Google Analytics, you'll find it's settings under the X menu item if X is installed and activated, or the Pro menu item if Pro is installed and activated. The Google Analytics extension allows you to easily add your Google Analytics tracking script to your website. Simply input your code snippet and select where you would like it to be output on your page (i.e. in your site's header or footer). While we won't cover how to setup Google Analytics itself, Google has some great documentation on how to get started with Google Analytics here. To set up the plugin, first of all, make sure you have a Google Analytics property already set up for your website if you don't. Create one before continuing this tutorial. When you have your Google Analytics property setup click on Admin then click on Tracking info then Tracking code and copy the script from the Website tracking box. Copy everything including the script tags. 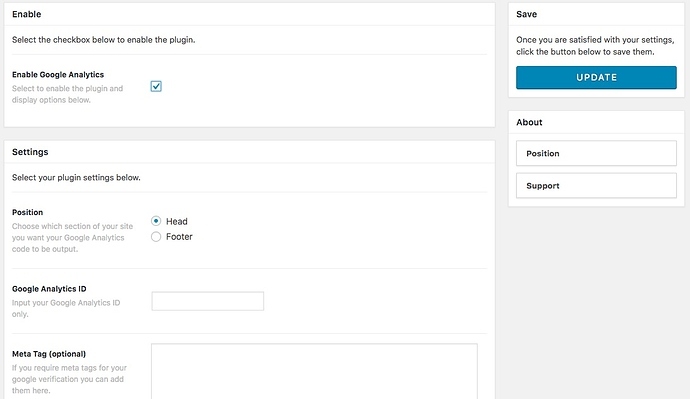 The final option is to select whether you want your tracking code to output in the header or footer of your website. Selecting Head will place the code in the head section of your website and is more likely to track all visitors to your site, even if they do not wait for your entire web page to load. Selecting Footer will place the near the closing body tag of your website and will track only users that have waited for your entire page to load. Once you're happy with everything go ahead and click on Update to save your settings. Congrats you've now successfully setup Google Analytics. How do I activate and use the Theme X Extensions?